I recently attended a fabulous luncheon in the city hosted by Foster Farms. The event revolved around wonderful food and great people and lively discussion. The space itself was lovely. The theme of the event was “The New Comfort Food” which was reflected beautifully in the dishes we were served. Comfort food no longer has to be heavy casseroles and guilt-laden treats. Today’s food lovers are now considering a lot more factors when they talk about “comfort food.” Sure taste will ALWAYS be the number one thing, but now we are looking at additional factors like where our food comes from and how it nourishes us. One of the dishes we were served at the luncheon (Roasted Apple Chicken Salad) brought back the familiar flavors of Waldorf chicken salad that my mom used to make when I was a kid. One of the ways I personally have seen my comfort food palette change is with the “lightening” up of dishes I remember as a kid: lighter sauces, grilling or baking instead of frying and the addition of more fresh, local produce and proteins (vs. using canned or frozen.) And so inspired by that chicken salad flavor profile, I came up with a new recipe for the chicken salad I used to have as a kid. 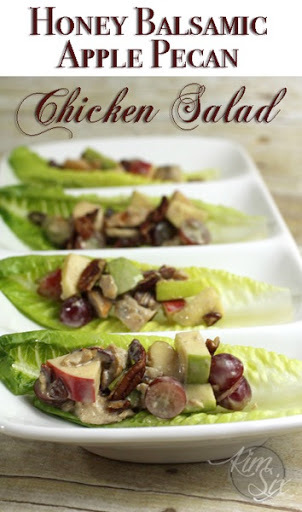 A light and fresh salad that can be served alone, as a side, or in lettuce cups as an appetizer. The sweetness of apples and grapes is blended with a creamy yogurt based honey balsamic dressing. Grill chicken breast until fully cooked. Allow to cool and then chop or shred into bite sized pieces. Set aside. To prepare dressing combine yogurt, honey, vinegar and salt and paper. Pour over fruit/nut mixture and gently stir with a wooden spoon. Add chicken and toss slightly. Chill. Salad can be served as is, or added to a single lettuce or Endive leaf to create an easy to serve lettuce wrap. Instead of mayonnaise I used greek yogurt. I used fresh fruit and honey for sweetness. I also used Foster Farms Simply Raised breast fillets which I grilled to add a smoky flavor. As I have shared previously, I exclusively choose Foster Farms chicken (either Simply Raised or Certified Organic) because I feel it is important that my family is served chicken that has never been treated with antibiotics. Plus I love that is a local company based here on the west coast. The apples and grapes are fresh and crisp, and I love the added rich crunch of pecans. The dressing, which is made with greek yogurt, honey and balsamic vinegar adds acid to balance the sweetness. I grilled my chicken and added it to the salad last in order to not soften the crisp grilled outside. I served it to my family in both romaine lettuce leaves as well as endive leaves. I personally like the pepper bite of the endive with the sweet creamy chicken salad, but if your family is less daring the regular romaine lettuce works too. You could even use iceberg lettuce if that is what you had on hand. I definitely would call this a “comfort food”! I couldn’t stop eating it!